Florida’s season is in full swing, and the Fresh Access Bucks (FAB) team is busier than ever! We have some updates on the team implementing the FAB incentives program across Florida as we prepare for an exciting 2017. The FAB team is sad to say farewell to Program Manager Carmen Franz. Carmen has been instrumental in growing the Fresh Access Bucks program from infancy, and was responsible for program management, development, and training new market partners. We wish Carmen the best in her future endeavors! Katie Delaney and Mary Hathaway are currently leading the FAB program. They will manage development and handle training for current and new markets. Kayvon Bahramian will continue to provide SNAP tech support to farmers markets throughout Florida. Fresh Access Bucks is a statewide program incentivizing SNAP recipients to redeem their benefits at participating farmers markets to purchase fresh, healthy foods directly from Florida farmers. The program matches what a SNAP cardholder spends, up to $20 every market day. 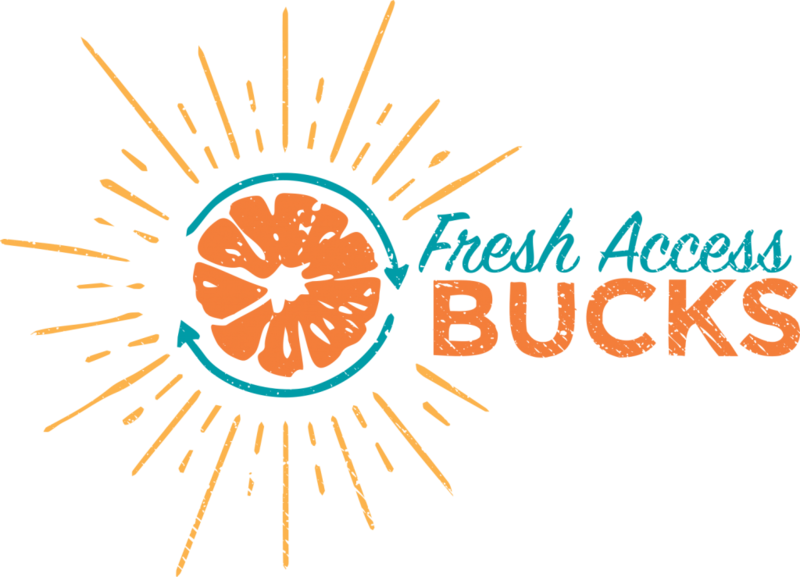 Customers can use their Fresh Access Bucks tokens right away or later on to buy Florida grown fruits and vegetables. Visit the FAB website for the markets currently participating in the program. New markets will be added this fall! 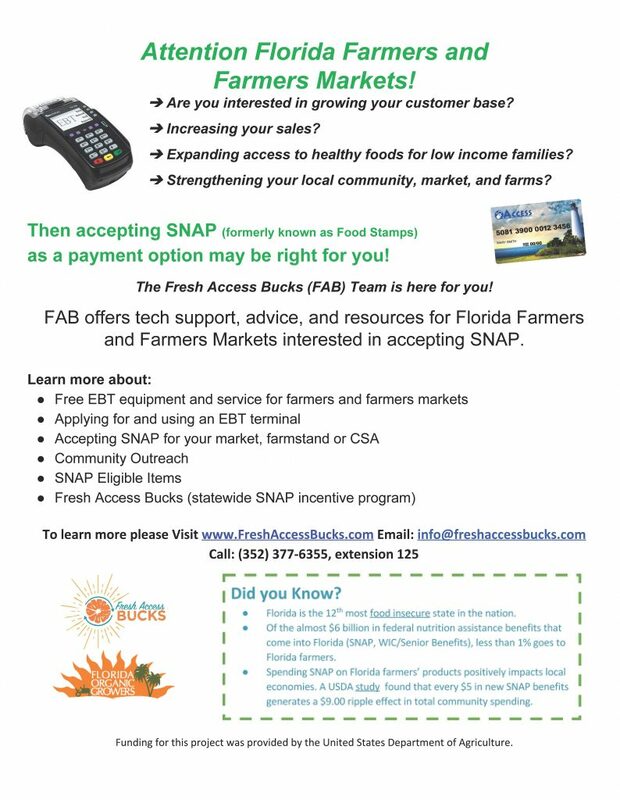 FOG is now offering SNAP Tech Support, a program that offers guidance, advice and resources for Florida farmers and farmers markets interested in accepting SNAP benefits (formally known as food stamps). If you’re interested in growing your customer base, increasing your sales, expanding access to healthy foods, and strengthening your local community and farms, then accepting SNAP as a payment option might be right for you! See the flier below for more details and how you can start accepting SNAP! What moves you to foster change? As 2015 comes to a close, we want to reflect on our amazing accomplishments this year through our Moving Monday campaign that spotlights how we are changing the food landscape throughout Florida. This past April was an amazing month for FOG as we received a Food Insecurity Nutrition Incentive (FINI) grant, which supports projects to increase the purchase of fruits and vegetables among low-income consumers participating in the Supplemental Nutrition Assistance Program (SNAP) by providing incentives at the point of purchase. Our proposal, “Fresh Access Bucks: Increasing Food Access And Florida Farmer Sales At Markets Statewide” will serve 50 markets over a 3-year period located in at least 21 counties throughout Florida! fresh, Florida-grown produce at farmers markets. Eight months into our project, we have already partnered with 28 markets in low-income communities and work with various community organizations, private businesses, and state and local government agencies to implement this program. Ultimately, this project will benefit more than 18,000 SNAP recipients throughout Florida and will increase farmer revenue by $2.1 million. Since the program’s inception in 2013, more than $200,000 was generated in revenue for Florida grown produce, more than 150 Florida farmers participated and expanded to more than 3,000 new market shoppers. In order to continue to serve communities throughout Florida with various workshops and programs associated with this grant, we need your support! Join with us as we continue this program and create a sustainable, local, just, organic food and farm system that is environmentally and ethically sound. 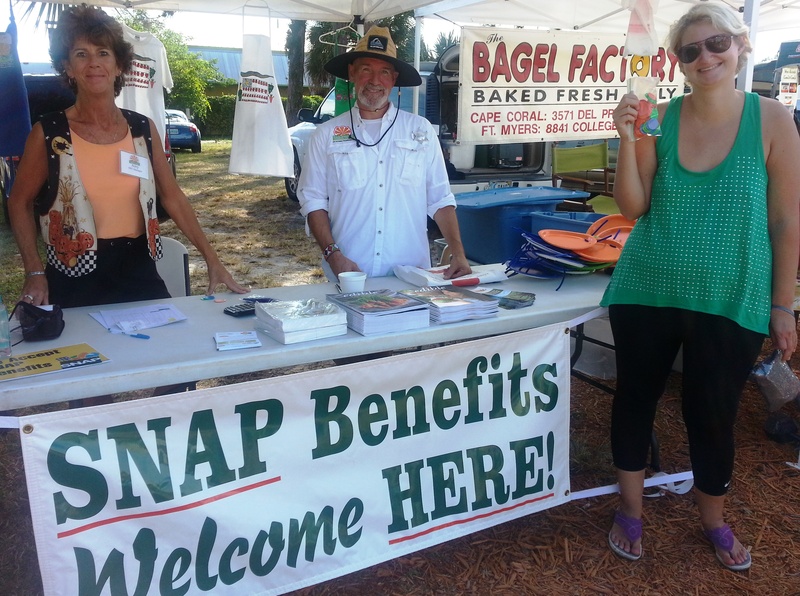 Florida Organic Growers (FOG) has been awarded a Farmers Market SNAP Support Grant (FMSSG) to increase the capacity of their Fresh Access Bucks farmers markets to accept Supplemental Nutrition Assistance Program (SNAP) benefits, formerly known as food stamps. Fresh Access Bucks (FAB) makes fresh, local produce more affordable and accessible to low income families while supporting Florida’s farmers and enhancing our local economies. It does so by increasing the purchasing power of SNAP participants by providing a one-to-one match for Florida grown fruits and vegetables. A SNAP cardholder who spends $10 of their SNAP benefits at a participating market receives an additional $10 to purchase fresh, local produce. The grant funding will increase the capacity of 20 Fresh Access Bucks partners managing the participation of SNAP at 29 farmers markets. It does so by providing each partner with funding to hire part-time staff to manage SNAP activities for the markets. By providing the partners with funding for part-time staff over two years, Florida Organic Growers anticipates greater SNAP redemption rates at these 29 markets through increased outreach and visibility of the program. In addition to supporting the establishment, management and promotion of SNAP/Electronic Benefits Transfer (EBT) services at those markets, FMSS grant funds will also expand Florida Organics Growers’ technical support to farmers and farmers markets wishing to accept SNAP. This project benefits more than 5,000 SNAP recipients throughout Florida and is expected to increase farmer revenue by $580,000 over two years by expanding the ability of these partners to implement SNAP activities, hiring a part-time Fresh Access Bucks assistant to expand technical support to farmers and farmers markets wishing to accept SNAP and increase Florida Organics Growers’ capacity to manage the Fresh Access Bucks incentive network statewide. For more information on Fresh Access Bucks and the participating markets around the state, please visit the Florida Organic Growers website. Florida Organic Growers is kicking off the growing season by partnering with farmers markets around the state to provide Fresh Access Bucks, a program that expands access to healthy food for low-income families. Currently, there are 23 farmers markets participating in the program. Fresh Access Bucks makes fresh, local produce more affordable and accessible to low income families while supporting Florida’s farmers and enhancing our local economies. It does so by increasing the purchasing power of Supplemental Nutrition Assistance Program (SNAP) participants by providing a one-to-one match for Florida grown fruits and vegetables. A SNAP cardholder who spends $10 of their SNAP benefits at a participating market receives an additional $10 to purchase fresh, local produce. This past April, FOG, the organization that created that program, was awarded the Food Insecurity Nutrition Incentive (FINI) Grant to continue providing FAB to communities in Florida. Through the grant, FAB will serve 50 markets over a 3-year period located in at least 21 counties throughout Florida. FOG works in partnership with markets in low-income communities, supportive community organizations, private businesses, and state and local government agencies to implement this program. Since the program’s inception in 2013, more than $200,000 was generated in revenue for Florida grown fruits and vegetables, more than 150 Florida farmers participated and expanded to more than 3,000 new market shoppers. This project will benefit more than 18,000 SNAP recipients throughout Florida and will increase farmer revenue by $2.1 million. For more information about the program and participating markets, please visit the Fresh Access Bucks website.